Not gonna lie, I’m a little embarrassed that my last post was exactly 2 months ago–yikes!!! But hey, that’s life, right! 🙂 It was hard getting back in the swing of stamping after taking a break. The best advice I can offer is to just start playing…..don’t worry about creating the perfect card, page, or project. Grab some paper, ink, and your favorite stamp set and just have fun!!! As a demonstrator, I was able to earn FREE Sale-a-Bration products in December, but “surprise-surprise” they sat untouched until last weekend (gasp)! Sale-a-Bration doesn’t officially start until next week (so I can’t actually show you pictures of the products) but I can show projects I’ve made using the products 🙂 I can honestly say you are going to LOVE it! Gorgeous Designer Series Paper, adorable card kits, super cute stamp sets, and of course, a must have embossing folder and NEW punch! 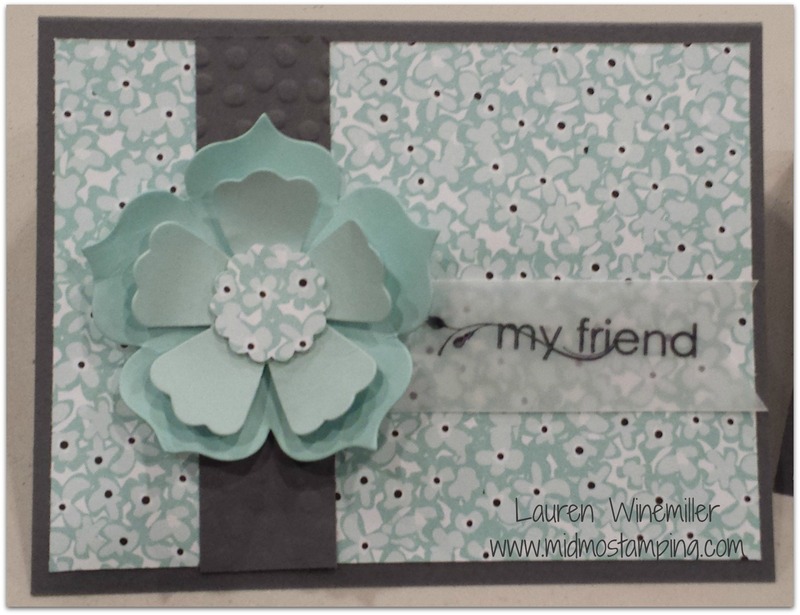 So here’s a quick look at one of the cards I created for my team members….my way of saying “thank you” for being part of my stampin’ family! 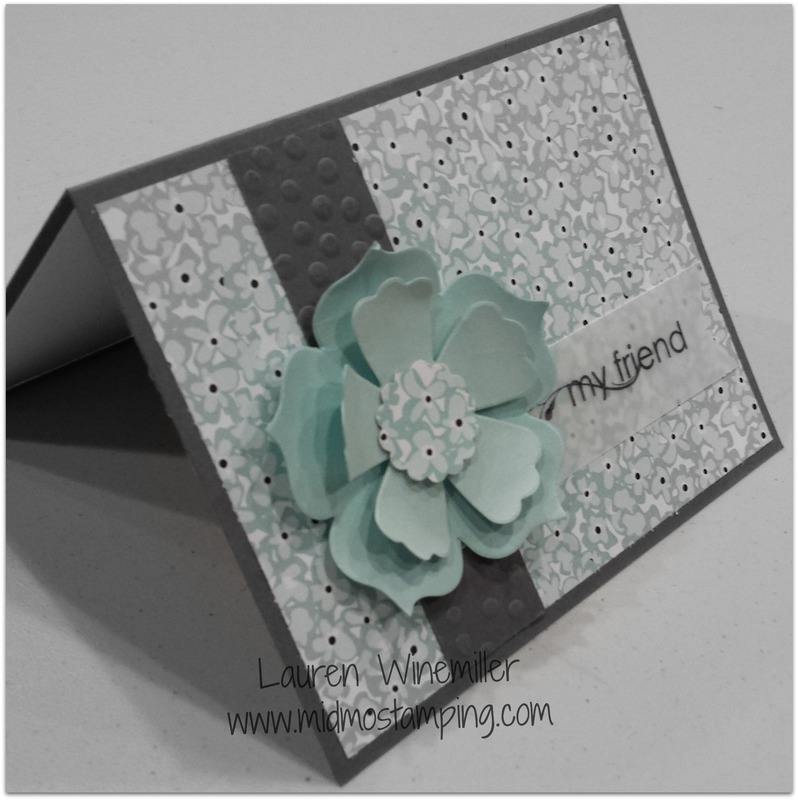 I knew I wanted to use the NEW Sale-a-Bration Designer Series Paper, and embossing folder (hint….can you see the super cute polka-dot pattern on the strip of basic grey). 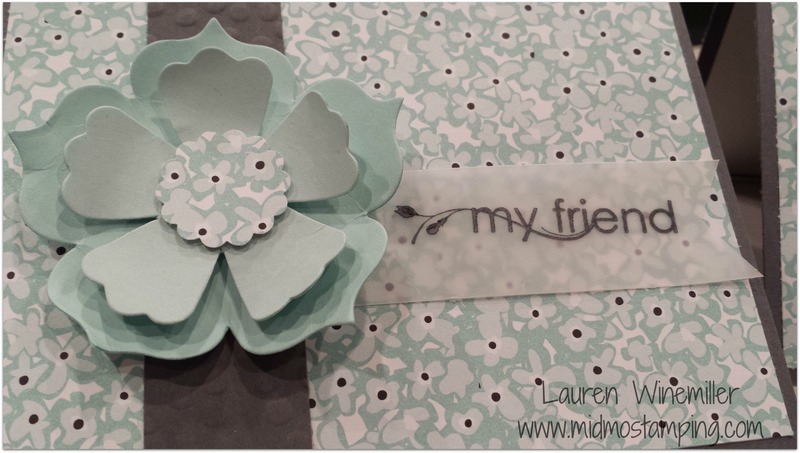 I popped up a few Fancy Flower die cuts with dimensionals, and added a strip of Vellum card stock for my greeting. Quick, easy, and a great way to showcase the new paper! If you haven’t received a copy of the NEW Spring Occasions Catalog, or the Sale-a-Bration Brochure, be sure to let me know and I’ll get one in your hands asap! Thanks for sticking with me, and I look forward to sharing more creative projects with you soon!